Alien invasion movies are probably the most common movies out there. Some are good, some are bad, and some are just plain mediocre. Some famous ones are District 9. Critically acclaimed and Oscar nominated, it was a huge success (although, I didn't like it). A more recent example is Battle: Los Angeles. Again, I didn't like this one either. Both films are flooded with great special effects, and a somewhat interesting story. But I found no entertainment in either. The future didn't look bright for Skyline, but was it better than I'd expected and hoped? Jarrod (Eric Balfour) wakes up. He is blinded by a stunning blue light being emitted from alien spacecrafts around America. But when he looks outside at the light, his face begins to burn and crack. Then we jump to 15 hours ago. Jarrod and his newly pregnant girlfriend Elaine (Scottie Thompson) fly to Los Angeles for a meeting. The next morning, the blue light incident takes place. Aliens are landing over the world, shining astonishing blue lights everywhere they go. Once you look at the light, you can't stop, and it will pull you in. Can Jarrod and his friends escape the city and leave the destructive path of the aliens behind them? I have to say, this is a pretty clever and original concept. It's unique, and it's quite enthralling. Directors "Brothers Strause", as they are known, have come up with a different and interesting idea. The thing is, the whole film is weighed down by poor acting, weak characters, and possibly the worst ending in film history. I'll start with the positive. The special effects in "Skyline" are mind blowing. I watched this on a Blu-Ray player, and it just blew me away. The simplicity of it is just brilliant. All it is is a light, yet it's shown which such grace and beauty that it takes the whole film to another level. I also really liked the designs of the alien spacecrafts. Each piece was jagged, and they all looked rough, but ruthless. All of the aliens, whether they were an actual alien or made of metal, were equipped with some of these blue lights, giving some consistency to it. I also have to praise the story. I know it's just a typical alien invasion movie, but I really liked the concept of this one. It was new, and original, and it really paid off. It also does boast a handful of shocks and scares. Obviously, some of the characters die, and its easy to predict who will survive, but I had no idea who would die first, and what order characters would be killed off in. This added a good element of surprise, and gave the film its horror aspect. Now, I do have to list the negatives, as there are quite a few. To start with; the acting. Eric Balfour, who played Jarrod, was terrible. He never looked genuinely scared or frightened, and no emotion came through him at all. The supporting cast were all OK, I found. Nothing amazing, nut they weren't bad. But, to be fair, it's hard to act well to an appalling script. And this REALLY was an appalling script. There was no depth to it, it was all 2D. It's a proper cringe moment when a character shouts "RUUUN!!" too. The screenplay probably was its weakest aspect, it's just filled with clichés and lines so bad they actually made me laugh. Another element I have to criticise is the ending. I won't go into detail, for those of you who haven't seen it, but all I will say is that it could go down as one of the worst endings of all time. It's just pointless. We sit through an hour and a half of a more then decent film, just to be horrifically let down. Such a shame. I gave this film 50%. If the ending was better, it would've gotten an 70% from me. 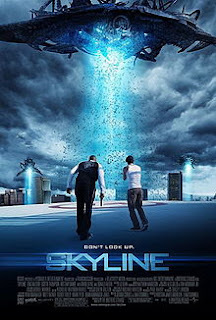 To Summarise: Loaded with stunning special effects, originality and genuine thrills, but let down by clichés, poor acting and a terrible ending, "Skyline" just adds to the list of mediocre sci-fi entries.